We love signs. We love paint and wood and saws and designing, everything to do with sign making. Some of you may not know this but we’ve been making signs for over 6 years now. We used to go by Lolly Jane Boutique and have shifted from selling signs and vinyl lettering to showing off sign how-to’s and way more on this ol’ blog of ours. In honor of our obsession, we wanted to show off some different signs you can display in and out of your house all week long! 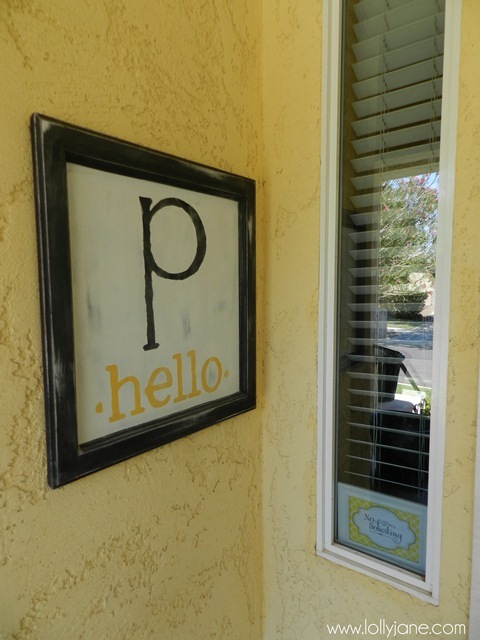 Today’s sign is an easy hello welcome sign, what a perfect way to greet your visitors! This welcome sign is super easy to make. Take an old frame, secure a lightweight piece of wood in place of glass inside. Paint the sides black and lightly sand to created a distressed look. Paint the middle white and apply your vinyl lettering stencil [technique here]. Paint the top letter black and your phrase underneath yellow [or your personal coordinating colors]. Lightly sand for a vintage feel. Really easy right? We’ll be showing off these types of signs all week, different parts of your house just to show you how diverse and fun signs can be! Do you spy that little white framed printable? Even a silly No Soliciting sign can be attractive! Be sure to come back tomorrow for another darling sign idea-this time indoors!